Zahiri, B., Mousazadeh, M., Bozorgi-Amiri, A. (2014). A Robust Stochastic Programming Approach for Blood Collection and Distribution Network Design. International Journal of Research in Industrial Engineering, 3(2), 1-11. B. Zahiri; M. Mousazadeh; A. Bozorgi-Amiri. "A Robust Stochastic Programming Approach for Blood Collection and Distribution Network Design". 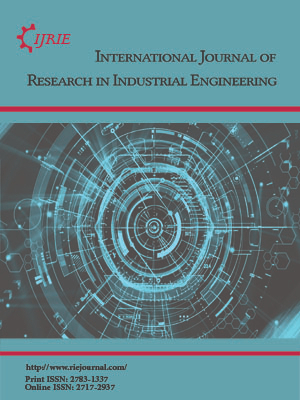 International Journal of Research in Industrial Engineering, 3, 2, 2014, 1-11. Zahiri, B., Mousazadeh, M., Bozorgi-Amiri, A. (2014). 'A Robust Stochastic Programming Approach for Blood Collection and Distribution Network Design', International Journal of Research in Industrial Engineering, 3(2), pp. 1-11. Zahiri, B., Mousazadeh, M., Bozorgi-Amiri, A. A Robust Stochastic Programming Approach for Blood Collection and Distribution Network Design. International Journal of Research in Industrial Engineering, 2014; 3(2): 1-11. Blood supply chain network design isanessentialpart of the total blood management systems.In this paper, a mixed integer non-linear programming (MINLP) model for the concerned problem is developed. Optimizing the facility location and flows between each echelon of the considered supply chain is our main focus in this study. Also, in order to handle uncertain nature of model parameters, a mix robust stochastic programming approach is applied to the model. Finally, to test the applicability of the proposed model, a numerical example is proposed using random generated data and then sensitivity analysis is done on a model parameter which play a rolein making trade-off between model robustness and optimality robustness.